Psalms 12:6 (KJV) The words of the LORD are pure words. : as silver tried in a furnace of earth, purified seven times. Psalms 12:7 (KJV) Thou shalt keep them, O LORD, thou shalt preserve them from this generation for ever. What Day Was Jesus Crucified & Buried? Data that shows that Jesus was buried on Wednesday evening (around 6:00pm) and rose from the grave on Saturday evening (around 6:00pm) according to our present day time scale. There is no such thing as Good Friday. There is not enough time for Jesus to be in the grave for three days and three nights if Jesus died on Friday and rose on Sunday. The reasoning such as Friday, Saturday, Sunday is wrong. Think about it. Jesus was buried in the evening. For him to have been in the grave for 24 hours he would have to have risen in the evening. The same reasoning can be extended for three days. If he was buried in the evening then he must have risen in the evening three days later for there to be a complete three day period. If Jesus died on Friday evening then from Friday evening to Saturday evening is only one day. Saturday evening to Sunday morning is only half a day. But, Jesus was in the grave three days and three nights. So, we can see that Friday is not when Jesus was crucified and buried. It must have been earlier. The solution to the problem is to first realize that the Jews measured the day differently than we do in modern society. The day began in evening. So, for example, if you woke up on Monday morning the day was half over because the started measuring the day the night before. The daylight portion of the day was also divided up differently. If these two bits of information are understood then it is not to difficult to see when Jesus died, was buried, and rose again. According to the Jewish day, the evening came first, then the morning… not the morning and then the evening. So, sundown (evening) was the beginning of the next day. For example, the Jewish Sunday began on Saturday evening when the sun set, about 6:00pm. Also, a complete day was measured from one evening to the next evening, not from midnight to midnight as we currently measure a day. This is a more logical division of time because a person would not have to have a watch to determine when a new day began. With our current time scale, our day begins at midnight so we MUST have a watch to know when the day changes from one day to the next. With the Jewish scale the day begin in the evening, there was a natural obvious change. When it got dark it was a new day. Genesis 1:5 (KJV) And God called the light Day, and the darkness he called Night. And the evening and the morning were the first day. Genesis 1:8 (KJV) And God called the firmament Heaven. And the evening and the morning were the second day. Genesis 1:13 (KJV) And the evening and the morning were the third day. Genesis 1:19 (KJV) And the evening and the morning were the fourth day. Genesis 1:23 (KJV) And the evening and the morning were the fifth day. Genesis 1:31 (KJV) And God saw every thing that he had made, and, behold, it was very good. And the evening and the morning were the sixth day. Leviticus 23:32 (KJV) It shall be unto you a sabbath of rest, and ye shall afflict your souls: in the ninth day of the month at even, from even unto even, shall ye celebrate your sabbath. Psalms 55:17 (KJV) Evening, and morning, and at noon, will I pray, and cry aloud: and he shall hear my voice. Our current time scale begins at midnight and has 24 hours. If we look at the military time we notice that the hour scale starts at 0:00:00 hours and ends at 23:59:59 hours (it never actually reaches the 24th hour). There are still 24 hours in the day but when we hit the 24th hour it is actually the beginning of the next day. The Bible shows that the day was divided up into 12 hours just like it is divided up today. John 11:5 (KJV) Now Jesus loved Martha, and her sister, and Lazarus. John 11:6 (KJV) When he had heard therefore that he was sick, he abode two days still in the same place where he was. John 11:7 (KJV) Then after that saith he to his disciples, Let us go into Judaea again. John 11:8 (KJV) His disciples say unto him, Master, the Jews of late sought to stone thee; and goest thou thither again? John 11:9 (KJV) Jesus answered, Are there not twelve hours in the day? If any man walk in the day, he stumbleth not, because he seeth the light of this world. John 11:10 (KJV) But if a man walk in the night, he stumbleth, because there is no light in him. This passage of scripture shows how the hour were labeled. Notice that they are labeled by the events of nature with sunrise the beginning and evening the end. The middle of the day (noon) is easily distinguished as well, the shadow has no length. Matthew 20:1 (KJV) For the kingdom of heaven is like unto a man that is an householder, which went out early in the morning to hire labourers into his vineyard. Matthew 20:2 (KJV) And when he had agreed with the labourers for a penny a day, he sent them into his vineyard. Matthew 20:4 (KJV) And said unto them; Go ye also into the vineyard, and whatsoever is right I will give you. And they went their way. Matthew 20:5 (KJV) Again he went out about the sixth and ninth hour, and did likewise. Matthew 20:6 (KJV) And about the eleventh hour he went out, and found others standing idle, and saith unto them, Why stand ye here all the day idle? Matthew 20:7 (KJV) They say unto him, Because no man hath hired us. He saith unto them, Go ye also into the vineyard; and whatsoever is right, that shall ye receive. Matthew 20:8 (KJV) So when even was come, the lord of the vineyard saith unto his steward, Call the labourers, and give them their hire, beginning from the last unto the first. Matthew 20:9 (KJV) And when they came that were hired about the eleventh hour, they received every man a penny. Matthew 20:10 (KJV) But when the first came, they supposed that they should have received more; and they likewise received every man a penny. Matthew 20:12 (KJV) Saying, These last have wrought but one hour, and thou hast made them equal unto us, which have borne the burden and heat of the day. Matthew 12:38 (KJV) Then certain of the scribes and of the Pharisees answered, saying, Master, we would see a sign from thee. Matthew 12:40 (KJV) For as Jonas was three days and three nights in the whale’s belly; so shall the Son of man be three days and three nights in the heart of the earth. According to the passage above, Jesus claimed that he would be 3 days and 3 nights in the heart of the earth. A day was 12 hours long; a night was 12 hours long as well. This shows that Good Friday, (Friday, Saturday, Sunday) is not a long enough period for Jesus to have been in the heart of the earth. We will see that according to the scriptures, Jesus died at 3:00pm. Friday @ 3:00pm to Saturday @ 3:00pm is only 1 day. Saturday @ 3:00pm to Sunday @ 6:00am is only 15 hours. Jesus would have only been in the heart of the earth for 1 day and 15 hours. If Jesus rose from the grave on Sunday morning, then he must have been buried in the morning as well for there to be a 12 hour day and 12 hour night as is mentioned in the verses above. We know from the scriptures that Jesus died @ 3:00pm. Therefore, he must have come back to life @ 3:00pm. We know from the scriptures that Jesus was buried in the evening. Therefore, he must have come out of the grave in the evening as well. Remember, Saturday @ 6:00 according to our division of the day is actually the beginning of Sunday according to the Jewish division of the day! There are three Hebrew words that are translated into the one English word “sabbath”. The three words are shabath, shabbath, and shabbathown. There is a general miss-understanding of the word ‘sabbath’. A common misconception is that the word ‘sabbath’ means ‘Saturday’. This is not the case. The word ‘sabbath’ does not mean ‘Saturday’, it means to stop working, to take a break, to rest, or holiday as is shown in the following definitions from Strong’s Hebrew Dictionary. Saturday was a sabbath (rest) day but there were other days that did not fall on Saturday that were sabbath (rest) days as well. a primitive root; to repose, i.e. desist from exertion; used in many implied relations (causative, figurative or specific):–(cause to, let, make to) cease, celebrate, cause (make) to fail, keep (sabbath), suffer to be lacking, leave, put away (down), (make to) rest, rid, still, take away. intensive from 7673; intermission, i.e (specifically) the Sabbath:–(+ every) sabbath. from 7676; a sabbatism or special holiday:–rest, sabbath. Leviticus 23:24 (KJV) Speak unto the children of Israel, saying, In the seventh month, in the first day of the month, shall ye have a sabbath, a memorial of blowing of trumpets, an holy convocation. Leviticus 23:25 (KJV) Ye shall do no servile work therein: but ye shall offer an offering made by fire unto the LORD. If the first day of the month always fell on a Saturday (which it doesn’t) then ten days latter would be a sabbath as well, which would be a Monday. So we see that sabbath days did not fall exclusively on Saturday. Leviticus 23:27 (KJV) Also on the tenth day of this seventh month there shall be a day of atonement: it shall be an holy convocation unto you; and ye shall afflict your souls, and offer an offering made by fire unto the LORD. Leviticus 23:28 (KJV) And ye shall do no work in that same day: for it is a day of atonement, to make an atonement for you before the LORD your God. Leviticus 23:29 (KJV) For whatsoever soul it be that shall not be afflicted in that same day, he shall be cut off from among his people. Leviticus 23:30 (KJV) And whatsoever soul it be that doeth any work in that same day, the same soul will I destroy from among his people. Leviticus 23:31 (KJV) Ye shall do no manner of work: it shall be a statute for ever throughout your generations in all your dwellings. Leviticus 23:32 (KJV) It shall be unto you a sabbath (intermission) of rest (holiday), and ye shall afflict your souls: in the ninth day of the month at even, from even unto even, shall ye celebrate your sabbath (intermission). Here is another case where a sabbath falls on a certain day (15th) of the month. This demonstrates once again that all sabbaths did not fall on Saturday. Leviticus 23:38 (KJV) Beside the sabbaths (intermission) of the LORD, and beside your gifts, and beside all your vows, and beside all your freewill offerings, which ye give unto the LORD. Leviticus 23:39 (KJV) Also in the fifteenth day of the seventh month, when ye have gathered in the fruit of the land, ye shall keep a feast unto the LORD seven days: on the first day shall be a sabbath (7677-holiday), and on the eighth day shall be a sabbath (7677-holiday). Mark 15:22 (KJV) And they bring him unto the place Golgotha, which is, being interpreted, The place of a skull. Mark 15:23 (KJV) And they gave him to drink wine mingled with myrrh: but he received it not. Mark 15:24 (KJV) And when they had crucified him, they parted his garments, casting lots upon them, what every man should take. Mark 15:25 (KJV) And it was the third hour, and they crucified him. Mark 15:26 (KJV) And the superscription of his accusation was written over, THE KING OF THE JEWS. Mark 15:27 (KJV) And with him they crucify two thieves; the one on his right hand, and the other on his left. Mark 15:28 (KJV) And the scripture was fulfilled, which saith, And he was numbered with the transgressors. Mark 15:30 (KJV) Save thyself, and come down from the cross. Mark 15:31 (KJV) Likewise also the chief priests mocking said among themselves with the scribes, He saved others; himself he cannot save. Mark 15:32 (KJV) Let Christ the King of Israel descend now from the cross, that we may see and believe. And they that were crucified with him reviled him. Mark 15:33 (KJV) And when the sixth hour was come, there was darkness over the whole land until the ninth hour. Mark 15:34 (KJV) And at the ninth hour Jesus cried with a loud voice, saying, Eloi, Eloi, lama sabachthani? which is, being interpreted, My God, my God, why hast thou forsaken me? Mark 15:35 (KJV) And some of them that stood by, when they heard it, said, Behold, he calleth Elias. Mark 15:36 (KJV) And one ran and filled a spunge full of vinegar, and put it on a reed, and gave him to drink, saying, Let alone; let us see whether Elias will come to take him down. Mark 15:37 (KJV) And Jesus cried with a loud voice, and gave up the ghost. Mark 15:38 (KJV) And the veil of the temple was rent in twain from the top to the bottom. Mark 15:39 (KJV) And when the centurion, which stood over against him, saw that he so cried out, and gave up the ghost, he said, Truly this man was the Son of God. Remember, Wednesday @ 6:00pm our time is actually the beginning of Thursday for the Jewish time. Mark 15:43 (KJV) Joseph of Arimathaea, an honourable counseller, which also waited for the kingdom of God, came, and went in boldly unto Pilate, and craved the body of Jesus. Luke 23:51 (KJV) (The same had not consented to the counsel and deed of them;) he was of Arimathaea, a city of the Jews: who also himself waited for the kingdom of God. Luke 23:52 (KJV) This man went unto Pilate, and begged the body of Jesus. Luke 23:53 (KJV) And he took it down, and wrapped it in linen, and laid it in a sepulchre that was hewn in stone, wherein never man before was laid. Luke 23:54 (KJV) And that day was the preparation, and the sabbath drew on. Luke 23:55 (KJV) And the women also, which came with him from Galilee, followed after, and beheld the sepulchre, and how his body was laid. Luke 23:56 (KJV) And they returned, and prepared spices and ointments; and rested the sabbath day according to the commandment. Wednesday was a sabbath day. John 19:31 (KJV) The Jews therefore, because it was the preparation, that the bodies should not remain upon the cross on the sabbath day, (for that sabbath day was an high day,) besought Pilate that their legs might be broken, and that they might be taken away. Sunday was a sabbath day. This verse is very revealing. It says ‘In the end of the sabbath’ and ‘as it began to dawn’. This verifies that the 1st day began in the evening the night before. When a person woke up in the morning the day was already half over because 12 hours of night had passed. The next point revealed in this verse is that it says ‘sabbath’ and ‘fist day of the week’. This points out that the 1st day of the week was a sabbath. Sunday was a sabbath! Mark 16:1 (KJV) And when the sabbath was past, Mary Magdalene, and Mary the mother of James, and Salome, had bought sweet spices, that they might come and anoint him. Mark 16:2 (KJV) And very early in the morning the first day of the week, they came unto the sepulchre at the rising of the sun. Luke 24:1 (KJV) Now upon the first day of the week, very early in the morning, they came unto the sepulchre, bringing the spices which they had prepared, and certain others with them. Luke 24:2 (KJV) And they found the stone rolled away from the sepulchre. Luke 24:3 (KJV) And they entered in, and found not the body of the Lord Jesus. John 20:1 (KJV) The first day of the week cometh Mary Magdalene early, when it was yet dark, unto the sepulchre, and seeth the stone taken away from the sepulchre. Jesus was crucified @ 9:00am. From noon until 3:00pm there was darkness over the whole land. At 3:00pm Jesus died, his soul went into the heart of the earth. If his soul went to the heart of the earth at 3:00pm, then for there to be 1 complete 24hour time period, he would have had to come to life at 3:00pm. The same reasoning goes for the 2nd and 3rd day as well. If his soul left at 3:00pm, then 3 days and 3 nights later would be 3:00pm. Therefore we can conclude that if Jesus died at 3:00pm then he must have come back to life at 3:00pm. If Jesus body was put in the grave in the evening then it must have come out in the evening as well. In the morning, when the ladies visited the tomb Jesus was already gone because He had left the grave the evening before! 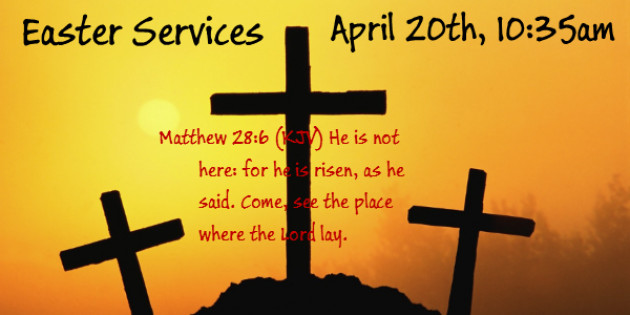 The evening before was our Saturday @ 6:00pm, Jesus resurrection. Saturday evening our time is the beginning of Sunday Jewish time. Go back 1 day and it will be Friday @ 6:00pm. Go back 2 days and it will be Thursday @ 6:00pm. Go back 3 days and it will be Wednesday @ 6:00pm, Jesus burial. We’re dedicated to sharing the wonderful message of the gospel of Jesus Christ with everyone that we possibly can. We hope you enjoy the resources available on our website and would love to have you attend one of our services. We are a friendly, country, small town, Baptist church. Please visit with us, you'll really enjoy it. Proverbs 18:24 (KJV) ¶ A man [that hath] friends must shew himself friendly: and there is a friend [that] sticketh closer than a brother. We are a a church for the whole family. We invite families like yours to discover the joy of being part of a friendly church that welcomes everyone and builds up their family. If you live in the following areas in Kansas you are close enough to visit and worship with us. Clearview Baptist Church is an independent, fundamental, Baptist church located in Johnson County between Lawrence, KS (University of Kansas) and Kansas City, KS on Hwy 10 in De Soto, KS. We only use the Authorized King James 1611 version of the Bible, the KJV (King James Version) also known as the KJB (King James Bible) or the AV (Authorized Version).